Do the words "hot milk sponge cake" make you want to yawn and move on or does it sound like a throwback that you just want to get up and make? For me, it's the latter since I love simple everyday cakes. I can again thank browsing through magazines for how I learned about this one. Hot milk sponge cake falls in the category of foam cakes - the kind where the cake's lift comes predominately from whipping eggs until they're, well...foamy. In some cases of sponge cakes, egg whites and yolks are separately whipped and no additional fat is added; in other instances, like with a genoise, you have whole eggs and additional yolks that are whipped together to a foamy texture before some butter or oil gets incorporated. In comparison to chiffon cakes, sponge cakes are less rich, with less fat, and their spongy texture make them great candidates for soaking up syrups for things like layer cakes or for rolling into a roulade. That's how I understand it anyway...the lines between the variety of sponge cakes and recipes can be blurry. All I know for sure if that basic sponge cakes always appeal to me. So about hot milk sponge cake. I'd never heard of it before stumbling upon it in a magazine recently. It's made here with whole eggs as well as a few additional yolks. Given my love of eggs and egg-rich cakes, that works for me! A little baking powder ensures lift and a mixture of hot milk and a little melted butter folded into the batter at the final step creates a light and springy cake that's also rich in flavor and sturdy enough to handle. This recipe from Alice Medrich I found offered three ways to turn this base hot milk sponge cake into various desserts with fillings. Sponge cakes are a great blank canvas for that but the options didn't appeal to me because I generally like to keep sponge cakes at their most basic as a simple at-home snack cake. 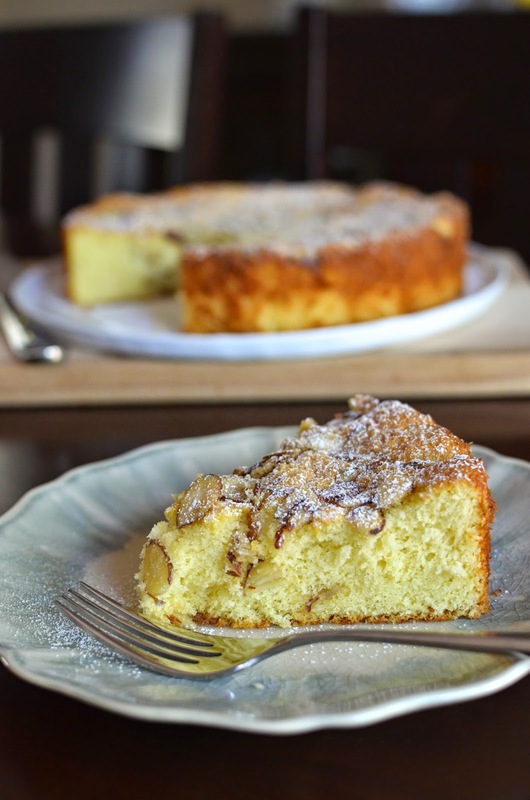 But I started thinking (uh-oh)...and got the notion of putting a caramelized almond topping on the cake like the topping on this (very delicious) almond semolina cake. Well...as I was placing the topping on the cake, it dawned on me that the topping might very well sink into the batter as the cake rises in the oven. I would have allowed the cake to bake a bit before adding the topping but since the cake is done in about 20 minutes, I didn't think there was time for that. In the end, I crossed my fingers and I'd say the outcome was moderately successful. It wasn't quite how I had envisioned it, and as you can see, there were a few pockets of heavier almond clusters that did sink into the cake. However, all was not lost. The almonds added flavor and a little extra sweetness (since they were coated with some egg whites and brown sugar), and definitely made the cake more interesting and flavorful without any other adornments. That's good enough for me and I'll count that as another experiment, another lesson in the kitchen! P.S. - My little blog got a mini makeover! I hope you like it as much as I do. Interestingly, Gold Medal flour is specifically recommended for this recipe because higher-protein flour like King Arthur will make for a coarser cake (...who knew, right?). Against recommendation, I stuck with my all-purpose King Arthur since I didn't want to invest in a bag of Gold Metal specifically for the purpose. The biggest part of making this cake is whipping the eggs. The stand mixer makes no work of whipping the 3 eggs and 3 egg yolks together until thick and foamy. Technology sure comes in handy. Once the eggs are ready, sift flour and some baking powder into the mixture in 3 parts, followed by 1/4 cup of hot milk and 2 tablespoons of butter. I use my big spatula to fold it all in. Now, for that caramelized almond topping. I took 2/3 cups of sliced almonds, tossed it in 2 teaspoons of egg whites and 2 tablespoons of brown sugar. Should you attempt this yourself, scatter the almonds on top of the cake, without any big clumps in one place (those were the bits that tended to sink). Then, cross your fingers and hope for the best. You can see from the before and after shots that some of the almonds did sink a bit but most of them did stay on the surface. I knew that my fellas wouldn't mind however the cake turned out so I tried not to sweat it. Now I can say I know what hot milk sponge cake is and I've enjoyed it at home with my family! ** Please note that using the topping like I did, some almond clusters are likely to sink into the cake. For other ways to use/transform this cake into more elaborate desserts, see these suggestions. Line the bottom of a 9-inch round springform pan with parchment paper. Preheat oven to 350 degrees and position a rack at the lower third of the oven. Place eggs, egg yolks, sugar, vanilla extract, and salt together in the bowl of a stand mixer fitted with the whisk attachment. 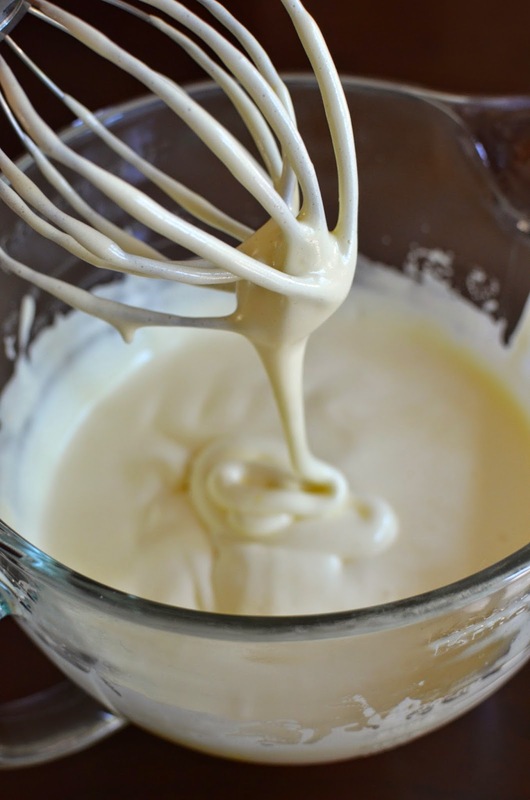 Whip on high-speed until tripled in volume and mixture forms a ribbon when the whisk is lifted, about 4-6 minutes. Heat milk and butter in a small saucepan until very hot but not boiling. Using a fine-mesh sieve, sift the flour mixture into the batter in 3 increments, gently folding with a large rubber spatula after each. Pour all the hot milk mixture into the batter and fold into the batter until incorporated. Scrape batter into the cake pan, smoothing over the top. Bake until golden and a cake tester inserted into the cake comes out clean, about 20-25 minutes. Allow cake to cool on a wire rack. Once cooled, run a knife around the sides of the cake, release the sides of the cake pan. Invert cake to remove parchment round, then place cake, right side up, onto a serving plate. Cake can be stored in an airtight container, at room temperature, for up to 3 days. Make topping by whisking the egg white until foamy. Remove 2 teaspoons of the whites to a bowl. Stir in almonds, brown sugar, and salt. Make cake as listed above. After smoothing the prepared batter into the cake pan, distribute the almond topping over the surface. Avoid placing big clusters of almonds in any one place since those are more likely to sink into the cake. Bake and cool as directed. Hot milk sponge cake? Never heard of one before but I'm glad I know what that is now! It looks so good, especially with the almonds on top (and who cares if they sank a little LOL) Looks great. Love your attitude, Ashley! And thank you! That was my game plan anyway and it worked good enough for us. My son didn't think he'd be a fan of this cake and he ended up really enjoying it and helping me polish off a good chunk over the course of a couple of days. I loved learning about hot milk sponge! I always love foam cakes, sponge of chiffon. This looks fantastic with almond topping. Chiffon is still my number 1 absolute fave in this kind of category and I also just love them in general! I LOVE the new look!! It's so pretty and fun! And I have never heard of hot milk sponge cake but it sure does sound good! And anything with an almond topping is always fantastic in my book! It sounds delicious. And if it's based on an Alice Medrich recipe, I'm sure it tastes wonderful! There you go! It was definitely one of the reasons why I really wanted to give it a go. She is one to rely on. I love the new look, it's SO beautiful Monica!! It definitely screams you, as does this cake. I'd say your topping looks well done too, so it's more than attempted :)! Isn't it fun to discover these types of recipes and spins? It's nice to learn and try something a little different. Enjoy the weekend! Thank you, Amy. Appreciate it! Definitely gonnna try this a.s.a.p!!!! : ) Thanks! You need a little something sweet like this to go with all your savory masterpieces! Yes, I love the neat and clean look of your blog and the cake looks so delightful! Hmmm sounds like Gold Medal Flour paid to be included in the recipe. :P I love the sound of this. Everyday cakes like this make me quite excited! Yum! This looks delicious - and I love desserts with almonds. I've not had hot milk sponge cake before, but a friend makes this delicious 3 milk cake that is absolutely divine - so I can just imagine this is good! Same here...love desserts with almonds almost as much as those with chocolate. I adore your new look! It is light and friendly and clean - perfect! I also love the look and description of this cake - a delicious finish to any meal. I agree - it is a blank canvas ready for a sauce or topping but pretty perfect plain. Love it! Great all around! Thanks, Tricia. And so true about this kind of cake. Keep it simple or use it to do it all up! This sponge cake looks so spongey and delicious! I just want to cut a big piece and take it from the screen! Yum! Sipping my afternoon coffee right now and this looks heavenly! Definitely could do with a big slice of it! The word 'hot milk sponge cake' definitely does not make me yawn. It makes me hungry and crave a big slice of this beautiful cake. The almond topping is brilliant. I love the little makeove toor...so elegant! I just love the name, too! haha. Thanks for the sweet words. Looks so fluffy! Everyday cake... In my house, there is no cake unless it's a special occasion. LOL. I can imagine you can change some ingredients to make different kind of cake with same method. I have never heard of hot milk sponge cake before, so it was interesting to learn new style of cake! haha - I guess cake isn't necessary "everyday" fare (though maybe it should be!) but I like these no-frosting type cakes that are easy to make and eat anytime! : ) I also liked making something I hadn't heard of before, too. Gosh, what a lovely cake. So perfectly risen and light with the gorgeous sweet, crunchy almonds. I'd say that experiment was a complete success Monica. Love the homely, nourishing nature of thus cake too! You're very kind, Jo. Thank you! Whoa, I'm not very familiar with hot milk sponge cakes, but it sounds really delicious! Egg-rich cakes are just so yummy. I love the sprinkling of almond topping as well! I heard the name of the cake and it just made me want to try! It goes down pretty easy so no complaints.